There was a time when hunters had to rely solely on their wit, bow sight, and skills. Thankfully, those days are long gone. Today, hunters have a wide array of accessories from best ground blind to tree stands which makes hunting easier. While we can do without some of these accessories, others are a must-have. For bow hunter having the best ground blind is must, besides the best compound bow or deer hunting crossbow and crossbow scopes in his/her arsenal. Well, A ground blind will help you get close enough to your prey to make a killer shot. But that’s not all, the best ground blind for bowhunting will come in handy when you want to survey an area. Additionally, a blind will protect you from the elements such as harsh weather, dangerous prey and so on. Thus, whether you are a fan of ground blinds or not, you will need one if you are to compete with your prey’s survival instinct. If you are new to bow hunting, a ground blind will be a vital piece of hunting gear. Why? You ask, well because it will help you concentrate on your aim and hone your skills. 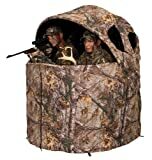 So, now that we have established that a ground blind is a must-have accessory for hunting. But what kind of ground blind should you buy? This is the vital question which is my job to answer. So, sit back and join me in exploring the different kinds of blinds available on the market. You are now probably wondering whether this article is worth reading. Well, you will be happy to learn that before sitting down to write this article, I tested many of the ground blinds available. I spent many hours testing and researching on each of the ground blinds that I have reviewed below. Therefore, this article is based on my own personal experience, expert opinions as well as reviews from other ground blind users. Before splashing money on a ground blind, there are several factors you ought to consider. So, before I reviewing my best ground blinds for bow hunters, here are the things to consider. Just because a ground blind is big does not mean it is ideal. Buying a big blind might seem like a good idea, but it can backfire on you. The reason being that it is difficult to brush in a big blind. My advice is to go for a blind whose size is manageable. Also, before settling on a blind get inside it to have a feel of its interior. Ideally, the right blind should be one that has enough room for you to make a standing shot. The overall design of a blind will dictate how well it performs in the field. While blinds with a hub design are faster and more durable, they are usually heavier. The best ground blind for bowhunting should have ports for visibility as well as for guns and bows. If you want to film your kill or survey with a camera choose a blind that has a port for a camera as well. However, the windows should not be too big. Certain animals may peer through the windows and see you. As I have already stated one of the reasons, you should get a blind is to protect yourself from the harshness of weather. Therefore, a ground blind should be durable enough to survive the outdoors. There are a lot of cheap blinds out there that collapse when you put them outdoors for too long. The outdoor camouflage of the blind should also correspond to your hunting surroundings. For example, you cannot buy a blind with green camouflage if you are hunting open woodland areas. The camouflage color of the blind you choose must correspond with the surroundings of where you predominantly hunt. Therefore, a ground blind used to hunt in wooded areas might not work in grassy areas. When choosing the camouflage color consider the predominant color of where you hunt, whether its green, brownish or light brown. The best ground blind should be easy to set up. While trying to set up a ground blind for the first time might be challenging, YouTube videos might help. Nevertheless, make sure the blind you purchase is easy to setup and take down. Topping my list is the Ameristep Care Taker Hub Blind-Realtree Xtra. There a number of reasons why I have ranked it number one on my list. The main reason is its size, measuring 69inches wide and 66 inches tall, I found it to have a lot of room. Also, I was pleased with the Realtree Xtra camouflage that this ground blind features. The fact that this blind is insect resistant was another big plus for me. No to mention its affordable price tag of less than $ 100. Shoot through port: The shoot through port is ideal for both gun and bow hunters, making it a versatile ground blind. Carrying case: The included case makes it easy to carry this blind from your car to where you want to set it up and back. 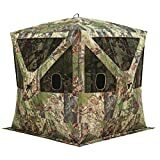 Based on my experiences, this is a great ground blind that is also reasonably priced. I have used it on turkey and deer hunts. Thus, while it is not water resistant, it the price, there is no better ground blind. I probably would give it the best ground blind for the money award. Were it not for the price, the Big Cat 350 Hub Hunting Blind would probably top my list, and for good reasons. My first encounter with this hub blind was when a friend of mine showed me his. The first thing I noticed is how tall it was. At the center, it is 90 inches tall, which I found to be amazing for making shots while standing. Interestingly, this blind had a smaller footprint than most of its competitors, something I found to be quite pleasing. This Blind rank number two because of it gives you enough room to make shots while standing. 70 by 70-inch footprint: While its footprint is relatively smaller compared to that of other blinds, it still offers you enough space to move around, without compromising on weight. There are very many cheap hunting blinds out there, but the big cat 350 hub blind is not one of them. Nevertheless, you get your money’s worth when you buy this blind as it comes with everything you require. Overall, its quality is great, and the fact that its interior is very spacious adds to its appeal. If you are the kind of hunter who prefers shooting at his/her prey while sitting down, then the Ghostblind 4-panel Predator Blind is a ground blind that you will love. So, what is it exactly? Well, this blind takes a rather innovative approach to camouflage. Instead of having one camouflage this blind has reflective mirror panels that mimic its surroundings. As such, you can set it up anywhere, and animals will never know you are there. Additionally, the reflective mirror panels give you an almost infinite selection of camouflage, which is a big plus if you ask me. Forward tilting design: Since it relies on mirror reflections, you might be forgiven for thinking it produces glare. However, the panels are designed to tilt forward thereby eliminating glare. 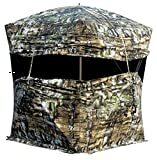 The fact that this Predator blind uses reflective mirror panels instead of traditional camouflage color is a big plus. Additionally, many who have used it note that they were able to shoot at prey from very close range. Therefore, it is one of the best ground blinds for deer hunting. The various two-man blinds I have encountered are usually big and bulky. However, there is one two-person blind that does not fall under this description. The Ameristep Deluxe 2-person tent chair hunting blind is a ground blind suited for wooded areas. While it can accommodate two persons, it is 61 inches wide, 52 inches deep and 20 inches high. Therefore, it is not as bulky as other two-person blinds, and this is the main reason why I have put it on my list. Six front and side zippered windows: The windows on this ground blind give you the ability to survey your area efficiently with your hunting companion. Chair attached: For convenience, this blind comes with chairs attached as well as cup holders eliminating the need to carry a chair on a hunting trip. Despite some few complains of it the blind leaking, I regard this to be one of the best ground blinds out there. In particular, because it comes with hunting chairs for ground blinds pre-installed. Additionally, this ground blind offers the convenience of a two-person blind without the bulkiness of a two-person blind. 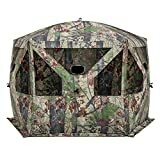 Barronett is a company known for manufacturing big and spacious ground blinds, and the Barronett Blinds PT550BW Pentagon Pop Up portable hunting blind is no exception. In fact, the main reason I chose this as one of the best is its size. The inside of this 5-sided blind is impressively spacious and offers a footprint of 41.5 sq feet. According to the manufacturer, this is 70% more space than you get with a traditional 4-sided blind. While it is a hard to verify this, there is no denying the size advantage of this ground blind. Sure, it might not be the lightest ground blind on the market, but it is one of the biggest. Compared to its sibling the baronet big cat 350, this blind is a big upgrade. Therefore, when you consider what you are getting, it is worth its rather hefty price tag. As such it deserves to be on the list of the best pop up blinds for bow hunting. The Primos Double Bull Bullpen ground blind is one very interesting ground blind. While there are those who never go hunting without it, there are others who have never used it. Nevertheless, regardless of how you feel about this blind, there is no denying its quality. A couple of my hunting buddies own primos double bull bullpen blinds. So, I have had a chance to interact with it on a number of occasions. Considered by many to be an upgrade to the older Double Bull Bullpen model, this deluxe model is very well made. Also, unlike its predecessor, it is easier to setup and takes down. 60 by 60-inch floor: While it is marketed as a compact blind, there is nothing compact about its interior which can comfortably hold two hunters. Double bull construction: One of the things that Primos is known for is its Double Bull material, which is durable and weather resistant. The Primos Double Bull is a great ground blind that is designed for optimal silence, which is important when hunting. Therefore, despite its minor cons, it is well worth purchasing and can offer you great service. And while it cannot be classified as one of the cheap hunting blinds, it is well worth the price. When you interact with the Guide Gear Silent Adrenaline Hunting Blind you will not believe that it costs less than $ 100. The reason being that it is a very well-made ground blind. I had a chance of testing this ground blind in the lead up to this article. And what I really loved about it is its blacked out interior and a full flip-up door that allows for ease of entry. The removable split panels were also a plus since they allow you to customize them based on your needs. This blind offers a lot and costs way less than other ground blinds. Flip-up side door: This flip-up door allows easy entry for all including persons in a wheelchair. This door is indeed a plus. Oversized zippered windows: The oversized zippered windows give you a good 180 degrees view of your surroundings. For its price, this ground blind is an exceptional piece of hunting accessory. Not only is it easy to access even for handicapped people, but it is also easy to shoot through. It can work for both rifle and bow hunters, which adds to its versatility. Overall, the ground blind is not as sophisticated as some other blinds on this list, but it gets the job done. The debate on which is better, treestand vs. ground blind is one that will not end anytime soon. However, I feel that for a bowhunter a ground blind is a much better option. While treestand blinds have their benefits, the ground blind is easier to set up and use. Therefore, if you are a bow hunter, you are better off with a ground blind. However, it is important to remember the pros and cons of ground blinds when purchasing one. Other than that, the 7 ground blinds on this list are a great option for both beginners and pro bow hunters. In conclusion, the best ground blind for bowhunting will depend highly on your needs as a hunter. 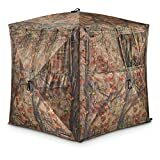 While there are some ground blinds on this list that appear to be a better option than the Ameristep Care Taker Hub Blind-Realtree Xtra, it tops my list because of its price to performance ratio.